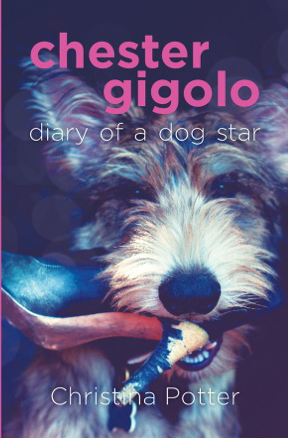 Some dogs are born to be stars… Chester Gigolo is a Berger Picard who dreams of stardom. In this diary of his ambitious first year, this canine actor, ­athlete, and author recounts his exciting life in New York City – from his rigorous puppy training to his athletic ­triumphs and quest for the limelight. Whether adventuring into town on his own, appearing on television, or ­posing for magazine covers, ­Chester always manages to find mischief. His unique hijinks have attracted national attention as well as occasional ­disapproval from his adoptive parents, Mom and Dad Potter. This Picard is one-of-a-kind, and his Diary of a Dog Star will entertain readers and dog-lovers alike. Christina was born an Army brat in Stuttgart, Germany. Her father was from Alabama and her mother is from Madrid, Spain. Though her parents were animal lovers, the frequent moves of a military family made dog ownership an impossibility. The first time she shared her life with a dog was when she met her Thai-born husband Taylor, son of US missionaries, and his two-and-a-half-year-old Golden Retriever Bogart. Bogart was her constant companion and quickly earned a permanent spot in her heart. He was a true gentleman of dogs and was infinitely patient with her mistakes. That was four dog generations, twenty-five years and four breeds ago. Each dog taught her something different: from therapy work, through competitive canine companion sports, to advertising and film work. Her first step out of “pet only” ownership was an obedience class she took just for fun with Bogart’s son Cooper. Little did she know that it would set her on the path to many new and interesting adventures in the world of canines. She and her husband competed in obedience and agility with Kelly and Cooper’s son Gable. They also dabbled in therapy work and, as a matter of fact, it was at a seminar for therapy dog certification twelve years ago that one of the speakers told them about her dog’s acting career. This piqued Christina’s interest and a few days later she met with an animal agent in New York city. Gable started working the following week and she now has the title of “animal wrangler” firmly ensconced in her resume with print ads, three feature films and countless commercials. All her dogs have been bitten by the acting bug, so it’s no surprise that Gable’s son Hudson is following in his father’s footsteps. Ten years ago, Christina strayed from the Golden Retriever world when she got her Afghan Hound Desi. Desi introduced her to rally, lure coursing and conformation shows, and, while she didn’t excel in any of these, it was thanks to her that Chinese Crested Morgan joined the family. Morgan recently became one of only six Cresteds in the United States to have gotten both a breed championship and an agility championship. One day, while on the American Kennel Club website, Christina discovered the Berger Picard. After extensive research of this intriguing breed, she knew that the puppy soon-to-be known as Chester would further enrich her life. All the classes and professional training she obtained, including a Master’s Degree in Canine Psychology, have not taught her as much as her eight dogs have. She is thankful for the patience, understanding and unconditional love they have given her and strives to make herself worthy of them every day. It is truly rewarding for her to see the look of satisfaction in her dogs’ eyes when they learn to negotiate obstacles in agility or learn new tricks for media work. Though she and her husband Taylor are busy with their “regular” jobs (he as a commercial pilot, she as a federal court interpreter) they make time to train daily. Every moment not spent at work is dedicated to the four dogs who currently share their lives.